(1990) "You Belong in Rock n' Roll"
"Fame" is a song recorded by David Bowie, initially released in 1975. Written by Bowie, Carlos Alomar and John Lennon, it was a hit in North America, becoming Bowie's first number 1 single in the Canadian Singles Chart as well as the U.S. Billboard Hot 100. The song was one of the more successful singles of the year, ranking at number 7 on the Billboard Year-End Hot 100. It was less successful in Europe, reaching number 17 in the UK Singles Chart. The song is one of four of Bowie's songs to be included in The Rock and Roll Hall of Fame's 500 Songs that Shaped Rock and Roll. With the Young Americans sessions mostly concluded by late 1974, the material was delayed while Bowie extricated himself from his contract with manager Tony Defries. During this time, he was staying in New York City, where he met John Lennon. The pair jammed together, leading to a one-day session at Electric Lady Studios in January 1975. There, Carlos Alomar had developed a guitar riff for Bowie's cover of "Footstompin'" by the Flairs, which Bowie thought was "a waste" to give to a cover. Lennon, who was in the studio with them, came up with the hook when he started to sing "aim" over the riff, which Bowie turned into "Fame" and he thereafter wrote the rest of the lyrics to the song. Lennon's voice is heard interjecting the falsetto "Fame" throughout the song. Bowie would later describe "Fame" as "nasty, angry", and fully admitted that it was written "with a degree of malice" aimed at the Mainman management group with whom he had been working at the time. In 1990, Bowie recalled the song as his "least favourite track on the album" and reflected: "I'd had very upsetting management problems and a lot of that was built into the song. I've left all that behind me, now... I think fame itself is not a rewarding thing. The most you can say is that it gets you a seat in restaurants." "Fame" became Bowie's biggest hit to that point in the US. It was his first number one hit on the Billboard Hot 100 chart, as well as his first to break the top 10, but would only reach number 17 in the UK Singles Chart. Bowie would later claim that he had "absolutely no idea" that the song would do so well as a single, saying "I wouldn't know how to pick a single if it hit me in the face." The alternate version of the single had "Golden Years" as the B-side. The Italian version of the single had "Space Oddity" as the B-side. Performances from the 1978 "Heroes" tour have been released on Stage (1978) and Welcome to the Blackout (2018). A live performance from the Serious Moonlight Tour, filmed on 12 September 1983, was included on the concert DVD Serious Moonlight (1984) and on the live album Serious Moonlight (Live '83), which was part of the 2018 box set Loving the Alien (1983-1988) and was released separately the following year. Live versions recorded during Bowie's 1987 Glass Spider Tour (in Sydney, Australia and Montreal, Canada) were released as part of the Glass Spider concert DVD/CD package. Bowie's 25 June 2000 performance of the song at the Glastonbury Festival was released in 2018 on Glastonbury 2000. An updated version recorded live by Bowie on 27 June 2000 was released on BBC Radio Theatre, London, June 27, 2000, a bonus disc accompanying the first release of Bowie at the Beeb in 2000. A November 2003 live performance from the A Reality Tour is featured on the A Reality Tour DVD, released in 2004, as well as the A Reality Tour album, released in 2010. It was released as the B-side of the US release of "Beauty and the Beast" in January 1978. The 7" single version appeared on The Best of Bowie (1980) as well as on Have a Nice Decade: The 70s Pop Culture Box (1998). Re:Call 2, part of the Who Can I Be Now? (1974–1976) compilation released in 2016, included an attempted reconstruction of the single edit, which has been criticized as inaccurate. Bowie performed the song in a 1975 episode of Soul Train, one of the few white artists to appear on the long-running black music television series. In 1990, a new mix was used on the soundtrack for the movie Pretty Woman (see below). It was used in the movie A Soldier's Daughter Never Cries by James Ivory and Ismail Merchant. It was used in the movie Copycat during a murder scene in a bar. It was featured in the Baseball episode The Tenth Inning by Ken Burns. It was featured in the movie Rush. It was used in the American Horror Story: Freak Show episode "Pink Cupcakes," along with a cover of "Life on Mars?" by Jessica Lange. It is actually an anachronism, since the plot is set in 1952. It appeared in the movie Foxcatcher in a post-match celebration. It was featured in the movie The House That Jack Built. Jeff Daniels dances to it in a scene in Something Wild (1986 film). Nina Hagen – The chorus in Nina Hagen's song "Heiss" is the vocal part and line "Is it any wonder" from "Fame"
George Michael – Performed live at his 1991 Cover to Cover tour. A remixed version of "Fame" was released by EMI in 1990 to coincide with the Sound+Vision Tour, the release of the Changesbowie compilation, and the Pretty Woman soundtrack. Bowie wanted to remix a successful American single for the tour and album release; of the two options ("Let's Dance" and "Fame"), "Let's Dance" was simply too recent. Bowie liked the choice: "It covers a lot of ground, Fame; it stands up really well in time. It still sounds potent. It's quite a nasty, angry little song. I quite like that." The "Gass Mix" was subsequently included on the Pretty Woman soundtrack. Song written by David Bowie, Carlos Alomar, and John Lennon. Film director Gus Van Sant directed the promotional video for this version, which featured clips from many of Bowie’s previous videos. In the music video, Bowie also performs a dance with Louise Lecavalier, one of the main dancers of the Québécois contemporary dance troupe La La La Human Steps (whom Bowie would collaborate with on the Sound + Vision tour). The US version of the video replaces some of Bowie's music videos for scenes from the movie Pretty Woman. David Bowie's "Fame" was used as the soundtrack of an animated music video of the same title, directed by Richard Jefferies and Mark Kirkland while students at California Institute of the Arts. The film, released in 1975, went on to win the Student Academy Award for animation and aired on NBC's The Midnight Special. ^ Elliott, Paul (30 May 2016). "The Top 20 Greatest Funk Rock Songs". Classic Rock Magazine. Retrieved 4 February 2019. ^ Timothy White's Rock Stars: Hearing Pictures: David Bowie's Sound + Vision (radio interview). 20 May 1990. ^ "Ultratop.be – David Bowie – Fame" (in Dutch). Ultratop 50. Retrieved 24 February 2013. ^ "Archívum – Slágerlisták – MAHASZ" (in Hungarian). Single (track) Top 40 lista. Magyar Hanglemezkiadók Szövetsége. Retrieved 23 January 2016. ^ "Dutchcharts.nl – David Bowie – Fame" (in Dutch). Single Top 100. Retrieved 24 February 2013. ^ "Norwegiancharts.com – David Bowie – Fame". VG-lista. Retrieved 24 February 2013. ^ "Official Singles Chart Top 100". Official Charts Company. Retrieved 24 February 2013. ^ "David Bowie Chart History (Hot 100)". Billboard. Retrieved 24 February 2013. ^ "David Bowie Chart History (Hot Rock Songs)". Billboard. Retrieved 31 January 2016. ^ "David Bowie Fame Chart History". billboard.com. Retrieved 6 April 2018. ^ "Top 100 Hits of 1975/Top 100 Songs of 1975". www.musicoutfitters.com. Retrieved 6 April 2018. ^ "Canadian single certifications – David Bowie – Fame". Music Canada. Retrieved 24 February 2013. 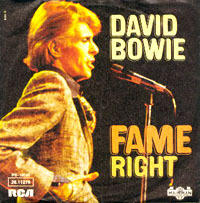 ^ "American single certifications – David Bowie – Fame". Recording Industry Association of America. Retrieved 24 February 2013. If necessary, click Advanced, then click Format, then select Single, then click SEARCH. ^ Altenburg, Ruud. "David Bowie - Illustrated db Discography > Songs: D-F". www.illustrated-db-discography.nl. Retrieved 6 April 2018. ^ Jagernauth, Kevin (28 August 2013). "Watch: New Clip From 'Rush' Plus Details On The Soundtrack Which Includes David Bowie, Thin Lizzy & Hans Zimmer". IndieWire. Retrieved 22 September 2013. ^ Goss, William (19 May 2014). "Cannes Review: 'Foxcatcher' Wrestles With the Cost of All-American Ambition". Film School Rejects. ^ Marotta, Jenna (14 May 2018). "'The House That Jack Built' First Reactions: 'Lars Has Gone Too Far This Time' As 100 People Walk Out — Cannes". IndieWire. Retrieved 23 October 2018. ^ "The Music of SOMETHING WILD | Cinematheque". cinema.wisc.edu. Retrieved 26 November 2018. ^ Gordon, Jeremy (10 December 2014). "The Smashing Pumpkins and Die Antwoord's Ninja Cover David Bowie's "Fame"". Pitchfork. Retrieved 11 December 2014. ^ dadsvolunteer (31 October 2016). "David Bowie - Fame - Animated Video (Midnight Special)". Retrieved 6 April 2018 – via YouTube. This page was last edited on 19 April 2019, at 13:30 (UTC).